Welsh cyclist Luke Rowe says changes to the sport must be made following the death of Antoine Demoitie. 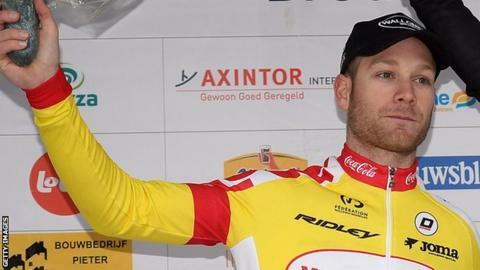 Belgian cyclist Demoitie died after a collision with a motorbike during Belgium's Gent-Wevelgem race. The 25-year-old was hit by the motorbike after several riders came down in a crash as the race passed through northern France. "The main issues come when cars or motorbikes have to pass the peloton and pass riders," Team Sky's Rowe said. "That is the fundamental issue we're looking into. "There's a lot of motorbikes in and around the race whether it be cameras for TV, photographers or police motorbikes. "In total there's around 50 motorbikes that work on each race. "We've got a riders union and we're coming together to think of a few ideas, whether we cap a speed limit on how fast they can overtake us. "Say we put a 10 kilometres per hour limit on it, if we're going 50kph they're only allowed to pass us 60kph or something like that." Demoitie, who was riding for the Wanty-Gobert team, was taken to hospital in Lille but died later. The sport's governing body, the UCI, said it would co-operate with all relevant authorities in an investigation into the incident. The Professional Cyclists' Association (CPA) issued a statement asking what would be done to improve safety. Despite Demoitie's death, attitudes to road racing will stay the same says Rowe, who has been competing in Three Days of De Panne race in Belgium. "As soon as that element of fear slips into your mind and you start thinking of things that could happen, that's when you're doomed to fail," he told BBC Wales Sport. "If you start thinking about crashes and the consequences and what could potentially happen then you're never going to be at the front of the peloton and you're never going to win any races." In a separate incident, another Belgian cyclist, Daan Myngheer, 22, died in hospital after suffering a heart attack during the first stage of the Criterium International in Corsica.